Australian Rules football can provide a great platform for people to make community connections and new friends. 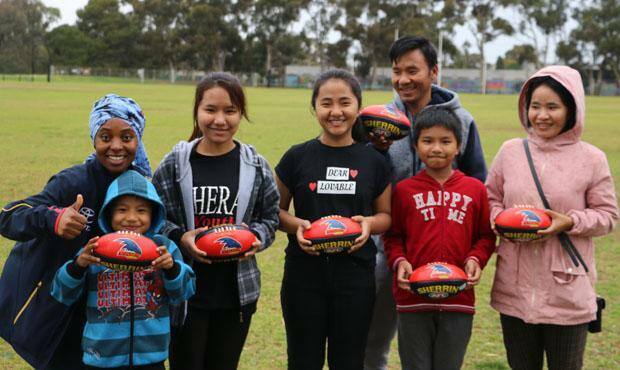 Adelaide has teamed up with AnglicareSA to provide 50 new footballs to families of different cultures who have recently arrived in South Australia. The donation, part of the Club’s multicultural programs, is intended to help make the transition to Australian life easier for the families. Crows Multicultural Liaison Officer Cecile Saidi met with a family who recently moved to Adelaide from Myanmar including father Zun Lai, mother Tin Ngoi and their children Zin Da Ooi (16), Zu Ni Par (14), Philip (12) and Lai Van Salong (7). As part of her role, Saidi is working to introduce new arrivals to various aspects of life in Australia, in particular Australian Rules Football. “Football is a core part of Australian culture but for a large number of the growing multicultural communities in SA it is relatively unknown,” she said. “For many new refugees, immigrants and other new arrivals, making the transition to an Australian lifestyle can be a tough process and fitting in is often one of the hardest parts of their move. “Australian Rules football can provide a great platform for people to make community connections and new friends. The family, who arrived in Australia in June, were eager to have a go at the sport. “We loved receiving the footballs and were very excited to get onto the oval and start practicing our kicking,” Zun Lai said. The footballs were distributed through AnglicareSA’s Settlement Services program, which provides on-arrival welcome and accommodation services to people who have recently arrived in South Australia. AnglicareSA provides services to new arrivals under the Federal Government’s Humanitarian Settlement Program.